Remember, when you are fishing from a boat, whether you are casting from the bow or from the stern or somewhere in between, in order to catch more fish, you are going to need to expand your casting skills so that you can present the fly to your "unfavored" side. (See Diagram at the foot of the blog entries to better understand the explanation) For the right arm caster you are probably good at casting to positions to the left ranging from 11 o'clock through 9 to the 5 o'clock position because your forward and backcasts are traveling over your right shoulder and the line and fly are not threatening injury to anyone else on the boat (barring heavy wind). If you attempt to cast to any of the clock points from 12 to 3 to 6 with your casts going over your right shoulder as noted above, your line and fly are going to cross the boat and endanger the captain or other occupants of the boat and/or hang up on the center console, rod rack or antenna. Conversely if you are a lefty on the bow- you're good to go from about the 1 o'clock position to 3 to 5 o'clock positions, as the line is crossing over your left shoulder and out of harm's way. However when you want to cast to the 12 to 9 to 5 o'clock positions- you run into the same problem, the fly line is traveling over the boat and others on-board are ducking and putting on their flak vests and safety glasses! 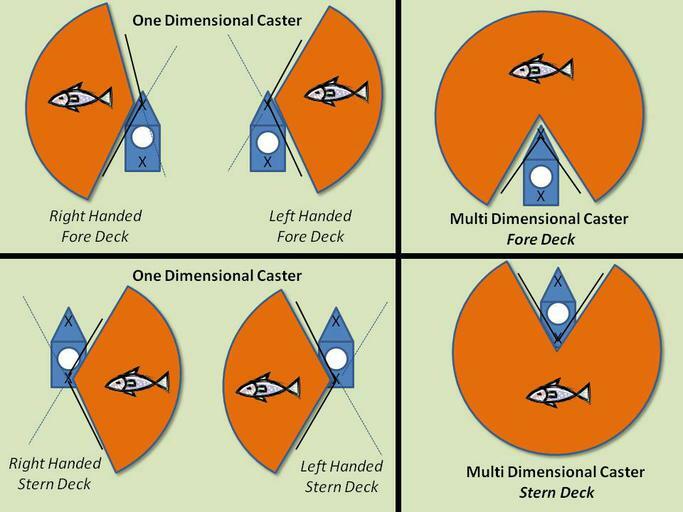 If you are the angler in the stern, the right handed caster is safe in casting to the 1 to 3 to maybe the 5 o'clock positions, and the lefty is good for 7 to 9 to 11 for the most part. The diagram below helps explain the scenario of right and left handed casters whose skills are limited and who can only cast effectively to their favored side. In each diagram the black lines represent the rod and forward cast direction and the lighter colored (faint) broken lines represent the rod and line in the backcast. Remember, the fly line ALWAYS follows the path of the tip of the rod. You have to extrapolate a bit to visualize the path of the fly rod and line in overhead casts (or slightly canted overhead casts) where the rod and line crosses near the caster's favored shoulder, to the light colored water areas. The light colored water (all non-red pie shaped water) represents the water these "One Dimensional Casters" are unable to reach without bringing the fly line over the boat into what I call the "danger zone". There are two fundamental casts you need to learn, and 45 minutes with a certified fly casting instructor (or a good video tape and casting book) can help to get you on the road to catching more fish and hooking less ears by converting you from a One Dimensional Caster to a Multi- Dimensional Caster. These are the "Off Shoulder" and "Backhand" casts (these are hot linked to You Tube videos illustrating these casting techniques). The Off Shoulder video is very short but it effectively illustrates this cast that when combined with a double-haul, creates additional line speed enabling the caster to increase their distance. For good measure if you can also learn to roll cast to your unfavored side using the Single Handed Off-Shoulder Roll Cast- wow, you've nearly achieved fly casting nirvana!